It would be better to visit Fira in the morning, when it is not that crowded. Have a glance at the Theotokopoulos Square, the meeting point overflowing with cafés and thousands of visitors! Gold Street with the jewellery stores and the commercial center Fabrika are poles of attraction, but you should also go ahead to Budi to enjoy the view of the caldera. The view is fantastic, as well as the happenings taking place at that spot. Now it is time for the Archaeological Museum of Thira (tel. +30 22860 22217), which includes collections of sculptures and inscriptions from the Archaic to the Roman Period, but also vessels from the Geometric until the Hellenistic Era. Visiting the incredible Museum of Pre-historic Thira (tel. +30 22860 23217) you will get into the spirit of the civilisation developed at Akrotiri and admire the indelible colors of murals which remained intact under the lava. The Bellonias Foundation is the cultural center of the island, standing out with its colors, yellow ochre and cypress green (tel. +30 22860 24960), whereas the Gyzis Mansion (tel. +30 22860 23077) has copper engravings from the 16th-19th century depicting local daily life scenes. The Santorini Orthodox Metropolitan Cathedral is situated in a unique position in the caldera and has wonderful religious paintings created by the Santorinian painter Christoforos Asimis when the church was rebuilt, following the earthquake of 1956. The Catholic Cathedral will impress you with its architecture and steeple. The Catholic women’s monastery, with twelve nuns, constitutes a remarkable monument. In the Folklore Museum, founded by Manolis Lignos in Kontohori of Fira (tel. +30 22860 22792), you will see a cave with the layers of lava deposits from the volcanic eruptions, as well as an authentic ‘kanava’ (see wine section). Tip: From Fira one can take the cable car to go down to Gialos. Otherwise you can very well ride a ‘barron’ (donkey!) or walk down 587 steps! Fira became the capital of Santorini in the late 18th century. Before that, during the Venetian Occupation, the capital of the island had been Skaros, which used to be one of the island’s castles –the spot where today stands the cliff with the spectacular view over Imerovigli (see page 79). When Skaros was gradually abandoned, the inhabitants settled to Fira which was then established as the new capital. First, Goulas (a medieval fort) was built on the top of the hill and the settlement developed around it. Besides the people from Skaros, it was also families from all over the island that moved to Fira. 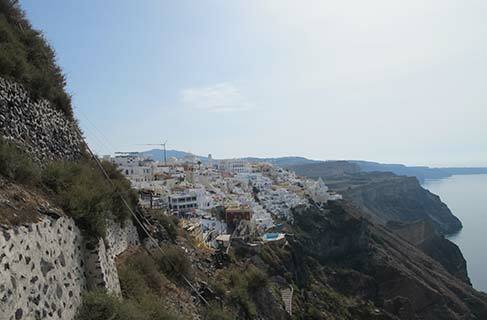 It is worth mentioning that until then, Fira had nothing else but kanavas (traditional wineries), vineyards and just a few summer dwellings. In 1956, an earthquake overwhelmed Fira. A great number of buildings were destroyed, among which the Orthodox Metropolitan Cathedral Panayia Bellonia (built in 1827). However, Fira was rebuilt from scratch always maintaining its urban structure, concentrating the central services and commercial traffic of the island, being a religious centre for both Catholic and Orthodox residents. General information: Fira started being built in the 17th century, when the risk for pirate attacks had reduced. It was then that the old capital (the medieval Latin castle Skaros opposite Imerovigli) was abandoned. As for the architectural style of Fira, there are two main types of dwellings: ‘yposkafa’ (cave houses, for the lower class) and urban houses (for the upper class). Υposkafa were domed caves dug into the volcanic tuff sand that covers the upper soil layer of the island; they comprised two consecutive spaces: one living room and one bedroom. There was also a small kitchen with a baking oven in the yard. As for urban dwellings, these were initially built in a plain form; however, in the 19th century, they took the form of mansions as a result of the prosperity brought forward by the flourishing of commerce and maritime in the 19th century. The architectural style was initially influenced by the Venetian architecture, but later on (late 19th-early 20th century) neoclassical morphological elements were also integrated. Churches also present high architectural interest: basilicas and cruciform-domed, with characteristic domes and square steeples. Remarkable indeed was the skill and passion of Santorinian craftsmen who attributed exceptional details to mansions and churches impressing all of us until today. Materials: The primary materials for the construction of houses and churches came straight from the island’s volcanic soil, such as volcanic black and red rocks, pumice, volcanic ash mixed with lime, while the wood was imported mainly from the islands of Ios and Crete. As there was lack of wood in Santorini, the most characteristic architectural element of both mansions and hyposkafa were vaulted roofs. Floors were mainly made of mortar, while yards and alleys were coated with volcanic rocks. Sights & sites: Every visitor today should discover some of the most characteristic samples of Santorinian architecture that are mentioned below. It is worth visiting Frangomahalas in Ano Fira and the suburb of Agios Minas in Kato Fira. In Frangomahalas, you will be impressed by the restored castle-house Goulas, Megaro Gyzi (family mansion of 17th century), Vazegios mansion with Venetian architectural style, as well as the Catholic Diocese complex comprising the churches of St John the Baptist (mid-17th century) and the Rosaria Dominican Convent (1825). Classical architectural sample is also the small church of Agios Stylianos clinging to the edge of the caldera, as well as the church of Agios Minas and Christ’s church in Kato Fira. The district below the Orthodox Metropolitan Cathedral has the most awesome view. Remarkable is also the Atlantis Hotel, which was built in 1955 and survived the earthquake. Do not miss Sarpaki Square at the southern end of Fira. Samples of modern architecture are the buildings of the National Bank and the Archaeological Museum with a beautiful indoor patio and palm trees on the renovated square right in front. Fira lies along the caldera in the centre of the island, starting from the area called Balades (where stands the abandoned mine-building) and spreading up to the Monastery of Agios Nikolaos in Firostefani. Kontohorio is the eastern district, while the harbor of Fira is located in Mesa Gialos, on the foot of the hill from the caldera side. That is where cruise visitors get off and go up to Fira in cable car, on foot (up the stairs) or on donkey back. About two kilometers out of the centre of Fira, there is Exo Gialos, a quiet beach with a picturesque cove, few hotels and one tavern. According to Emmanuel A. Lignos, Fira is divided into the following main districts: Centre, Kato Fira (below the Orthodox Metropolitan Cathedral), Frangomahalas (Catholic district, northeast), Kontohori (east) and Firostefani (north), the last one considered to be the natural expansion of Fira. Mr Emmanuel A. Lignos, founder of the Folklore Museum in Kontohori, has highlighted the churches that we should see Fira: In Kato Fira, it is worth visiting the churches of Agios Minas, Agios Ioannis Theologos and Christ’s church, which is also called ‘the first Metropolis’. In Kontohori, do not miss visiting the churches of Agios Efstathios (celebrating on 20/9) and Panagia Langadiou (celebrating on 9/9). In Firostefani, you should see the church of Panagitsa (celebrating on 15/8) and the Catholic church of Saints Theodore dedicated to Panagia (Virgin Mary). With regard to monasteries, worth visiting are: the Orthodox Monastery of Agios Nikolaos in Firostefani and the Catholic Dominican Convent, opposite the Catholic Metropolitan Cathedral dedicated to St John the Baptist (Domo).The Orthodox Cathedral has a divine view over the caldera. The Catholic Cathedral will impress you with its architecture and imposing steeple. It is possible to attend the Mass at the Convent with the Catholic nuns every evening. Fira today is the liveliest place on the island: breathtaking view, exquisite shops, delightful restaurants and exciting night life! Do not miss discovering the heart of Santorini. Picturesque alleys, extravagant mansions, impressive hyposkafa on the foot of the caldera, numerous corners with spectacular view, rich history and enchanting beauty. Fira has been writing its own history upon the rocks of the most astonishing caldera in the world.